Ahead of the global financial crisis of 2007-08, house sales and prices boomed. 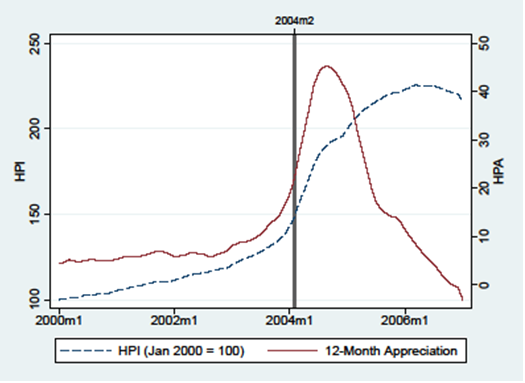 In new research, Lindsay Relihan and coauthors examine whether this boom was the cause or result of the large increase in take-up of non-traditional mortgage products around the same time. Comparing house prices and the use of alternative mortgage products in housing markets across the US, she finds that the use of these non-traditional products rose ahead of house prices in the early 2000s. She writes that by making payments easier, these non-traditional mortgage products increased access to loans, which in turn encouraged housing markets to boom. The dominance of the 30-year fixed rate mortgage is a defining feature of the United States’ housing market. For a brief period in the mid-2000s, however, this dominance was challenged by the popularity of non-traditional mortgage products that allowed borrowers easier access to credit through variable interest rates with teaser periods, extended terms, and interest only or with repayment schedules featuring payments lower than the interest due. In effect, borrowers could obtain a mortgage with lower monthly payments in the short-term than were available through the 30-year fixed rate mortgage. 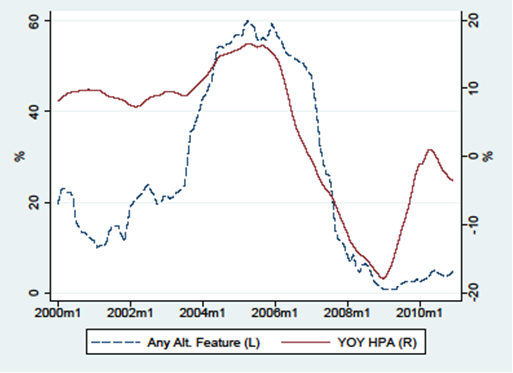 As Figure 1 shows, the share of mortgages with at least one non-traditional feature grew sharply during the last decade. At their peak in 2005, about sixty percent of all purchase loans in the United States included at least one non-traditional feature. Their coincidence with rapid house price appreciation during the housing boom led many to conclude that they were used to speculate on the housing market and, thus, partly to blame for the boom. However, given that incomes rose little during that period, borrowers may have instead flocked to non-traditional mortgage products to maintain affordability in a time of increasing home prices. Accordingly, it remains unclear whether their restriction would prevent future booms or rather hurt borrowers by restricting more affordable mortgage products. 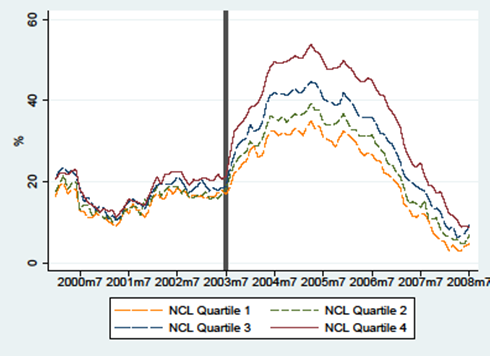 To study the relationship between the start of the housing boom and the use of non-traditional mortgages, we first identify the starts of housing booms in individual US counties. 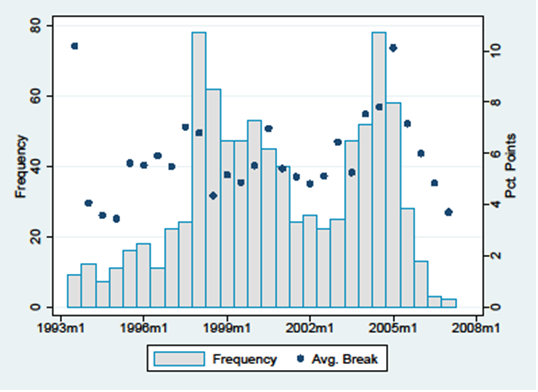 Figure 2 shows that the national trend obscures a substantial variation in the timing and size of local house price booms. Some markets housing booms started well before 2000 and house price growth at those starts accelerated in the range of 4 – 10 percentage points. Next, we use this variability to systematically track the use of non-traditional mortgage products around the local housing boom starts. To illustrate, the house price index for Clark County (containing Las Vegas) is shown in Figure 3(a). Our methodology estimates that the Clark County housing boom began in February 2004. In the figure, there is a clear difference in both the house price path and rate of house price appreciation on either side of the estimated housing boom start. In Clark County, we find that the rapid adoption of non-traditional mortgage products began earlier than the estimated start of the local housing boom (shown in Figure 3(b)). Like in the experience of Clark County, we find that the increased use of non-traditional mortgage products preceded the accelerated rise of house prices in markets with house price booms that began after the year 2000. In the year before the start of these booms, the share of new purchase mortgages with any non-traditional feature increased 5 percentage points on average, primarily due to the use of variable rate and interest-only mortgage products. Moreover, in late-booming markets, we find important changes to credit supply that occurred before the booms began. For example, we find that mortgage denial rates steadily fell in preceding years. We also see an abrupt shift away from mortgages financed by the Federal Housing Administration towards subprime loans in the year immediately before the start of the boom. Strikingly, we find no concurrent shift in “hard information” measures such as borrowers’ credit scores or loan-to-value ratios that would indicate lower loan quality. These results expand on other findings, that lenders altered their loan supply along dimensions that would be less frequently and consistently reported to investors. 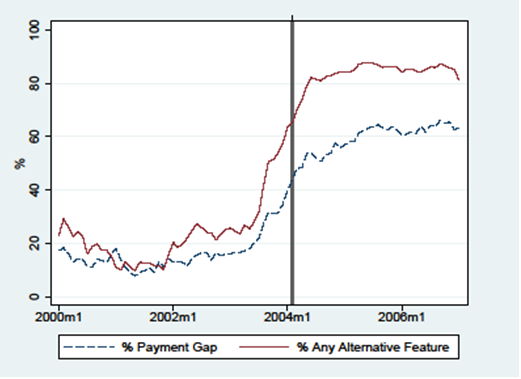 Overall, these findings support the view that financial innovation in the 2000s contributed to rising house prices by reducing payment constraints. A key question regarding the county-level patterns we document is: what mechanism drove the expansion of non-traditional mortgage products in markets after 2000? To answer this question, we exploit the dramatic increase in Treasury rates in mid-2003 for plausibly externally influenced variation in lenders’ financing constraints. Earlier work shows that in response to the higher Treasury rates and concurrent collapse of mortgage refinancings, lenders rapidly expanded their use of the private-label securities market to finance new mortgage originations. This led to a sharper increase in mortgage supply and house prices in markets with higher shares of lenders connected to the private secondary market — that is, those lenders that relied more on non-core deposits prior to the increase in Treasury rates. 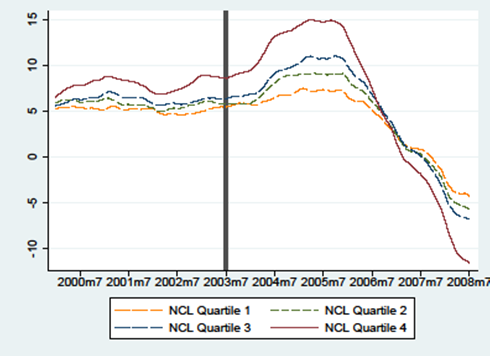 In Figure 4, we show that, in addition to higher prices (panel (a)), counties exposed to a higher share of non-deposit lenders also experienced an immediate increase in the use of non-traditional mortgage products following the 2003 increase (panel (b)). Notably, while the growth in non-traditional mortgage products is instantaneous in mid-2003, house prices appreciate most sharply in the top three quartiles of the non-core deposit distribution of counties, but only after 6–12 months. In addition, across each quartile of exposure to non-deposit lenders, growth in alternative mortgage products increased monotonically with the share of non-deposit lenders. This pattern suggests that an important mechanism during the 2000s was an external shock to lenders’ cost of capital that drove them toward the secondary market, where non-traditional products flourished. Can we conclude, therefore, that non-traditional mortgage products are always a cause rather than a consequence of booming markets? We uncover a stark difference in the systematic relationship across markets with a house price boom that started before 2000. In these early-booming markets, non-traditional mortgage products emerge as unlikely contributors to the sharp increase in house prices at the start of a county-specific boom. 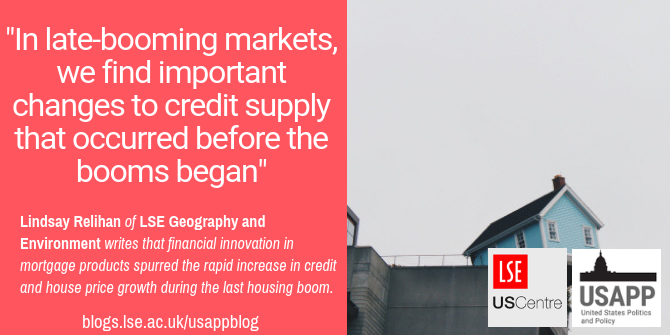 In addition, for early-booming markets, we find little evidence of credit supply growth in the years immediately before or after the start of the boom. In fact, we find that, on average, denial rates increased, the share of loans with full documentation grew, and the credit quality of borrowers remained constant around early booms. We also find evidence that incomes in these markets grew faster than the national trend in the years before a local boom. These results suggest that the impetus for the housing booms of the late 1990s were driven more by economic fundamentals and that borrowers turned to these products to maintain affordability. In the wake of the crisis, regulators have placed significant limitations on a number of these non-traditional mortgage features by excluding them from the definition of a “Qualified Mortgage” for regulatory purposes. As laid out by the Consumer Financial Protection Bureau in their January 2013 report, lenders will no longer be able to underwrite a qualified mortgage loan based on a “teaser” rate in determining the ability to pay. Moreover, mortgages cannot contain interest-only, have lower payments than the interest due, or extended term features if lenders want to meet the legal presumption of complying with the qualified mortgage regulation. As we have shown, whether restricting these contract features will affect the formation and magnitude of housing price cycles in the future depends crucially on the context of the use of these features. Although these rules have only recently come into effect, the consequences of limiting these products is also likely to reduce credit access for some households, while guiding others into more standard contracts. These rules may complement other efforts to encourage mandatory mortgage counseling. Even with these shifts in the composition of borrowers and their contracts, our results show that banning these products is unlikely to eliminate housing booms altogether. Lindsay Relihan is an Assistant Professor of Real Estate Economics and Finance at the London School of Economics. She is an applied microeconomist with interests in urban economics, household finance, housing, and real estate. Her research agenda is focused on understanding how the spatial relationships between firms and consumers shape outcomes in consumer credit markets.